Since opening in August 2017 the Queensferry Crossing (QFC) has attracted admiration from industry and the public alike. This week the team that created the crossing were recognised in these prestigious awards. 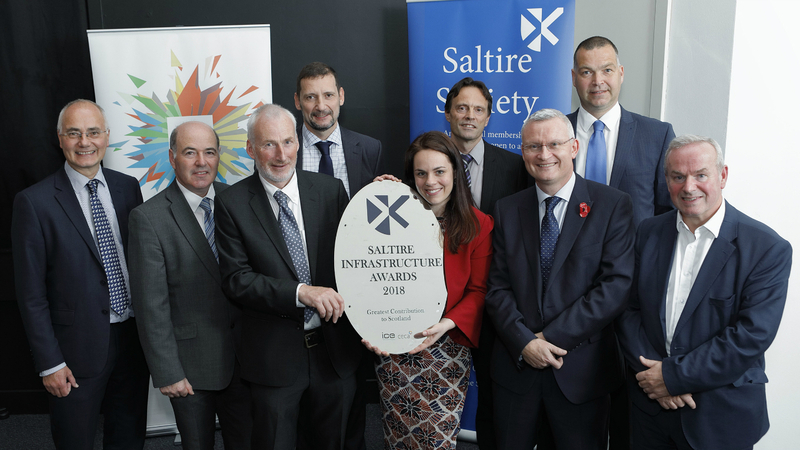 On Wednesday night the ICE Saltire Awards were held in the National Museum for Scotland, Edinburgh, where the Queensferry Crossing (or Forth Replacement Crossing) received the award for Greatest Contribution to Scotland. Judges recognised the iconic status of the bridge and the engineering excellence that went into its design and construction. Judges commended the blend of superb design and function. ”An engineering project of extraordinary scale and complexity the Forth Replacement Crossing epitomises professional excellence in all aspects of its design and construction. View the full list of ICE Saltire award winners and judges comments here. The ICE have created this short video on the Queensferry Crossing, celebrating the engineering achievement and bridge's importance to Scotland. Earlier in the week Scotland’s Festival of Procurement concluded with the Go Awards Scotland evening in Glasgow, celebrating excellence in public procurement in Scotland. The Queensferry Crossing was successful in the GO Infrastructure Project of the Year Award category. The replacement crossing was later singled out for the GO Excellence Scotland Award 2018/19.